This complete silicone hose kit is designed to replace all of the crumbling plastic and rubber awfulness that is the factory breather hose system. Fits transverse 1.8T cars with engine codes AWV, AWW, and AWP through the 2002 model year. Please Note: Fits transverse 1.8T engines with the AWW, AWP, and AWV engine codes manufactured from model year 1998 - 2002. If your car is model year 2003 or newer with the AWP engine code, click here for the correct Late Breather Hose Kit. 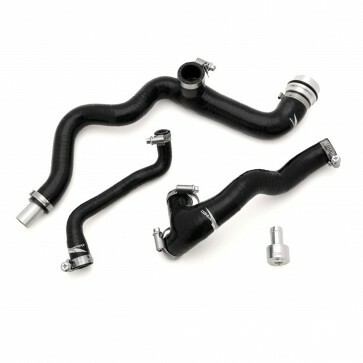 Early cars require the 20mm Valve Cover Breather Hose (06A 103 221BH) and Early Block to Intake Manifold Hose (06A 103 221BQ).